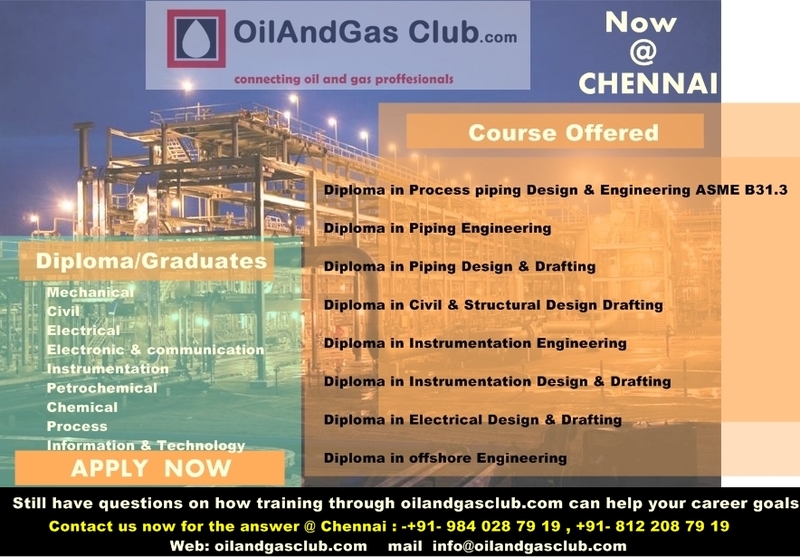 Oilandgasclub.com, Chennai offers Job Oriented EPC Training programs for working persons and fresher engineers. Oil And Gas Club is an international Oil and Gas and conference and training organization. 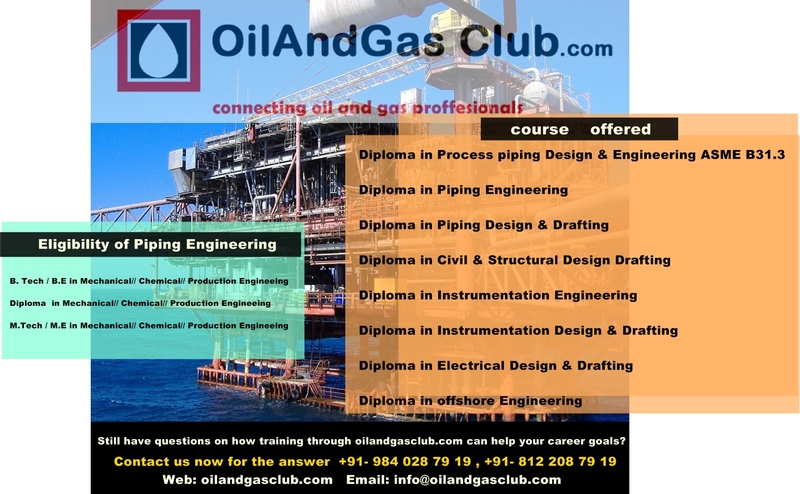 O&G club provide Engineering Design Training for onshore & offshore industries. The Faculties are qualified and well experienced professionals who have worked with various multinational companies onshore and offshore. The Oil and gas club has got smart class presentation, computer based animation, safety videos, slide shoes, standards, rules and regulation in the oil and gas industries. 1)Experienced professionals who are working in other engineering industry and wish to pursue a Career in petrochemical, oil and gas industries. 2)Job seekers who like to work in oil and gas industries. 3)Freelancers who wish to Expand their skills and expand their of service oil and gas industries. 4)Teaching professionals who work in educational service and wish to change their career towards oil and gas industries. 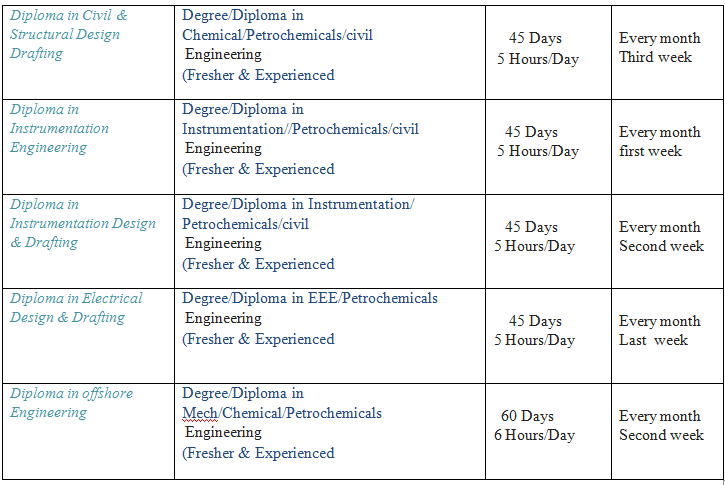 Students who wish to pursue higher educational having strong oil and gas industry can also benefit from this course potential to get part time jobs in these industries while they study abroad and helps to achieve financial assistance and finally get into jobs on a full time profile with in oil and gas industries. Students can do this course and virtual project parallel to their university studies virtual project can be tailor-made to university project on request upon completion they can have a cv attractive to oil and gas industries. 1)You can upgrade your skills through certain events conducted by us. 2)100 % focused on the industry based program. 3)Designed for both Fresh engineers and working professionals to attain growth in oil and energy industry. 4)Get access to industry experts for technical advice and more. 5)Guided by the industry’s renowned professional with unprecedented knowledge of the Oil and Energy industry. 6)Getting trouble shooting support during work time. 7)Providing all Training Material and technical Drawing, documents and case study materials. 8)You can visit any time our technical support club on ad hoc basis in some case this is chargeable. 9)You can attend technical discussion forums free of cost. 10)Interactive, interesting and motivational training sessions. 11)Free updates on technical increments as newsletter in Oil and gas sector. 12)Attend industry events, organized by us and our partners. Still have questions on how training through help your career goals? We have Third party hostel accommodation available for the trainees @ Rs. 7,000/ – for 30 Days for shared accommodation and food. What are the Main Components of a Centrifugal Pump?